This Chicken Souvlaki recipe is super-easy to cook in the oven or on the grill, and absolutely delicious when loaded up with all of your favorite toppings! Over the past few months, I’ve had a few items mysteriously “disappear” after unloading them on the dining room table after a trip to the store. A bag of frozen peas…a package of corn tortillas…a snack pack of almonds…a few mints…ALL GONE. (Oh, and 6 packages of dry beans apparently sampled and rejected and scattered all around the dining room like thousands of pieces of confetti too, just for fun.) This was a brand new predicament for my little household. But I had one prime suspect. ? ? ? Sure enough, the evidence proved (sorry, tmi) that he was, in fact, very guilty. And also, thankfully very alive after his tabletop raids. But still…very full, and very guilty. That said, though, the plot thickened this week. And I learned that I may have given him an unfair share of the blame, because new evidence has confirmed that Henry may in fact have…an accomplice! I had brought home all of the ingredients to make this Chicken Souvlaki for dinner, including a fresh new bag of pita. And, per my new habit, I intentionally unloadeded the bags of groceries on the taller, non-accessible-to-an-11-lb-dog countertop, when I had to buzz out to a meeting before putting the rest of the groceries away. And sure enough, a few hours later I came home to Henry and his much taller friend, Fiona waiting for me, both happily snoozing in a carb coma with two very full bellies, and the pita packaging literally sitting on the floor just a foot away from them. ? Apparently, you can teach old dogs new tricks. Or they can teach themselves…especially when some delicious pita bread is involved. Ha, safe to say, I’ve now become even more disciplined about putting my groceries completely away immediately. And Henry and Fiona and I have had some long chats about making good decisions. And of course, I did end up making a special trip back to the store to pick up more bread, because these Chicken Souvlaki pitas were just begging to be made. ? I’m guessing most of you are familiar with this Greek classic. But did you know that it’s actually super easy to make at home?! All you need are a few minutes of prep time, a few simple ingredients, and a hot grill or a hot oven. And — opa! — this recipe can be ready to enjoy in no time. Then once they have marinated for at least 30 minutes (or up to 1 day), cook them in the oven or on the grill until they’re just done, and still nice and juicy. 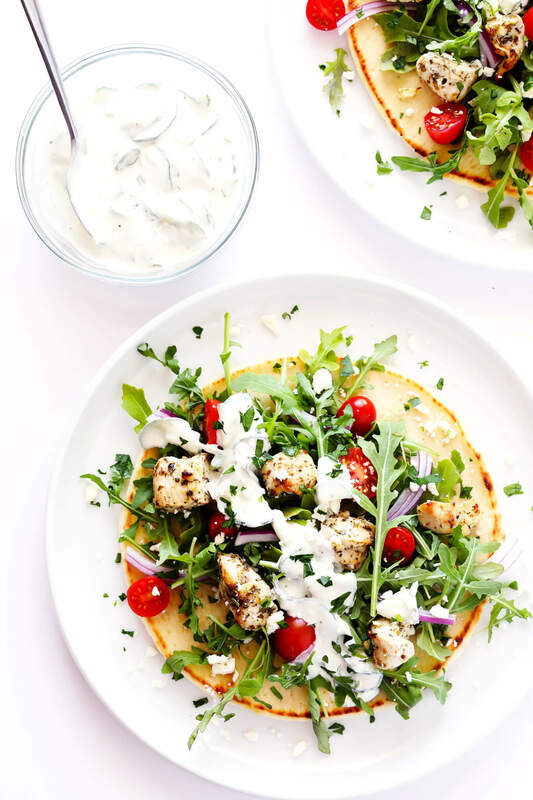 Then, while the chicken is cooking, grab some pita bread (presuming it hasn’t “disappeared”), and load it up with all of your favorite pita toppings! I went with fresh arugula, cherry tomatoes, red onion, feta cheese, tzatziki sauce, and parsley. But any number of toppings (like roasted red peppers, diced cucumbers, Kalamata olives, other greens, etc.) would also be delicious! 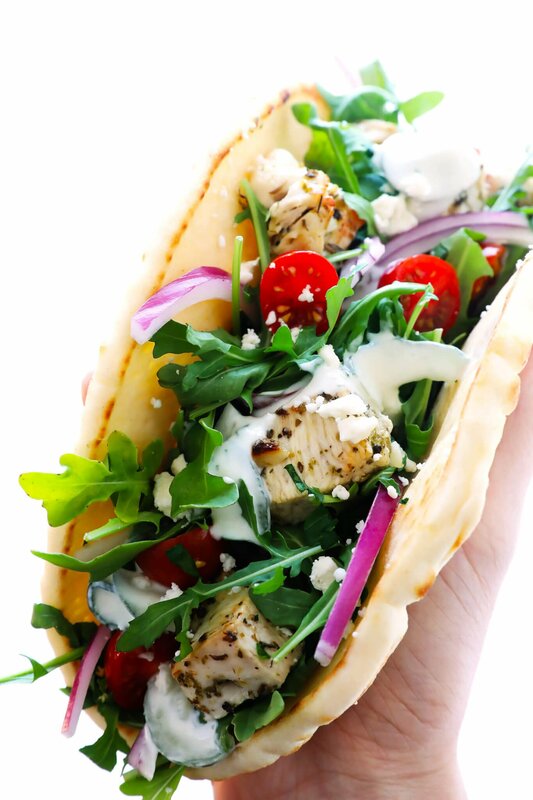 …and this gorgeous, fresh, and flavorful pita sandwich will be yours to enjoy. And hey — pro tip — it tastes delicious even when the chicken is chilled. So be sure to cook a little extra, and then you can enjoy your souvlaki as leftovers for days to come either on pita, or in a fresh salad, or in a rice bowl — you name it. ? 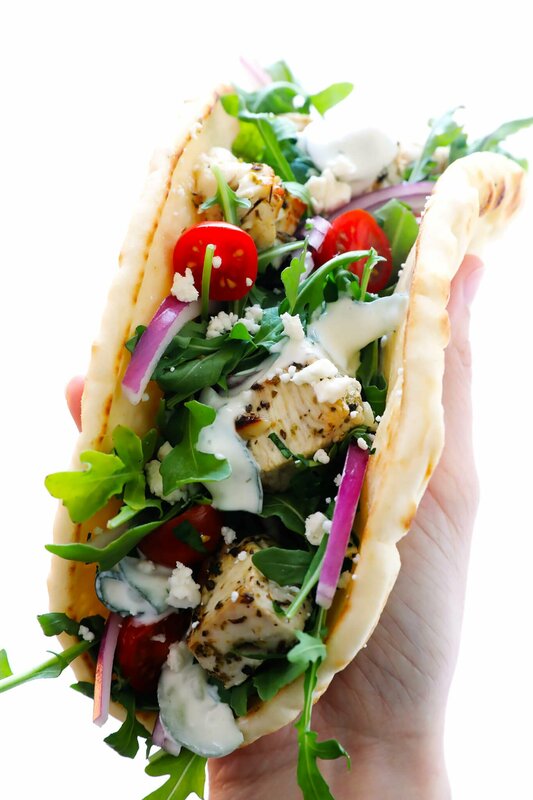 This Chicken Souvlaki recipe is easy to cook in the oven or on the grill, and tastes DELICIOUS when loaded up in a pita with all of your favorite toppings! 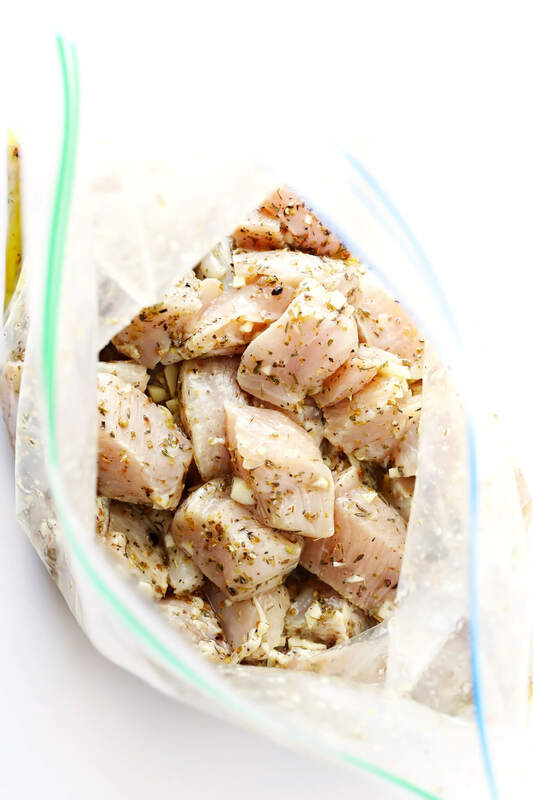 Combine chicken pieces, garlic, olive oil, oregano, salt, black pepper and lemon juice in a large ziplock bag or mixing bowl, and toss until the chicken is evenly coated. Seal/cover and refrigerate for 30 minutes, or up to 1 day. Remove chicken from bag/bowl, and discard the leftover marinade. 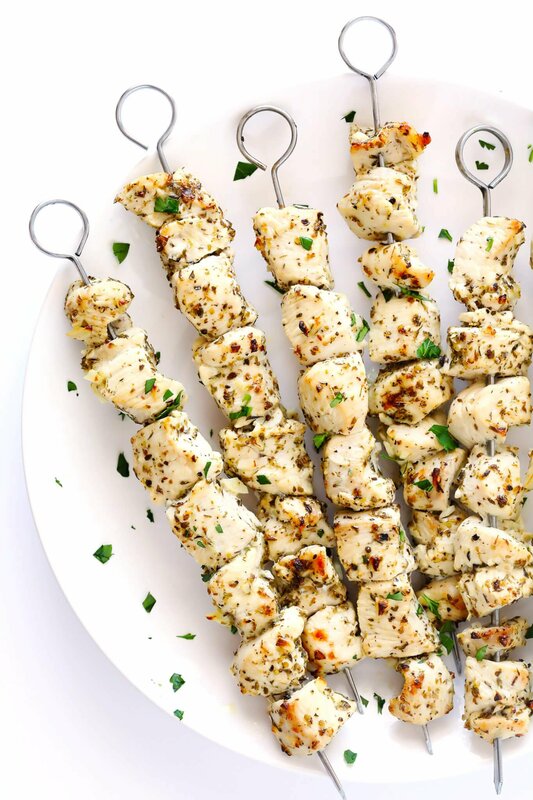 Thread chicken onto skewers**. To Cook Chicken On The Grill: Preheat grill to medium-high. Place skewers on the grill and cook for 6-8 minutes, turning once, until the chicken is cooked through and no longer pink inside. Transfer skewers to a separate plate, and set aside. To Cook Chicken In The Oven: Preheat broiler, and place the rack about 5-6 inches from the top of the oven. Place skewers on a large baking sheet, and broil for 6-8 minutes, turning once, until the chicken is cooked through and no longer pink inside. Transfer skewers to a separate plate, and set aside. 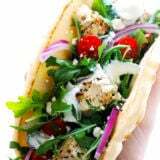 To assemble the chicken souvlaki pitas, lay a piece of pita bread out on a flat surface, and top it with a few pieces of chicken and your desired toppings and tzatziki sauce. Serve immediately. 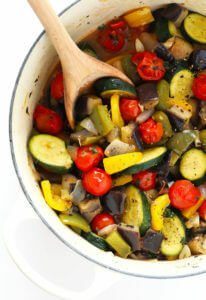 *I recommend using traditional olive oil for this recipe, not extra virgin olive oil, since it has a higher smoke point. **If using wooden skewers, be sure to soak them completely in water for at least 30 minutes before cooking so that they do not burn. Is the lemon juice part of the marinade? Or do you use it more like a topping? I see it listed in the ingredients but I’m not sure where in the recipe it goes. Looks delicious!! The lemon juice is a key ingredient in the marinade. Also dressing if you serve a Greek salad with it. As you prob know, lemon and oregano are staple flavourings for Greek cuisine. Love chicken souvlaki! But is the lemon juice supposed to be added to the marinade? The recipe doesn’t say. Hi Barb! It’s listed in the first step of the instruction: Combine chicken pieces, garlic, olive oil, oregano, salt, black pepper and lemon juice in a large ziplock bag or mixing bowl, and toss until the chicken is evenly coated. Seal/cover and refrigerate for 30 minutes, or up to 1 day. We hope you enjoy! Hi Nancy! You could roast it like we do here. We hope you enjoy! You don’t mention where the Tzatziki sauce goes – I assume first ingredient on the pita then the toppings? Looks easy and delicious! Hi Lucille! It’s in step 5 of the recipe. You just put it on top of the chicken and everything else, before serving. We hope you enjoy! Sounds delicious. What is the creamy sauce drizzled on top? How can I save your recipes in one recipe box? Hi Leslie! We’d recommend using Pinterest and creating a recipe board. We find that’s the easiest way to save recipes (online at least). So delicious and EASY! I just made this recipe today for my boyfriend and I with a few minor adjustments; I used grape seed oil instead of olive oil, I cooked the chicken in a pan instead of grill or oven, and I used grape tomatoes instead of cherry. We had this with a side of garlic rice pilaf and it was a perfectly tasty and quick meal. I might use a tad less salt next time but other than that this recipe was a hit, and I will be making it over and over again. We had plenty leftover for lunch/dinner tomorrow for both of us too, yay! Love the blog, thanks!! Oh my! I would love this for my lunch today! It just calls my name! And it has all my favorite ingredients. Yay! We hope you enjoy it, Julia! We have a “bread bandit” at our house too! Except he’s a German Shepherd, so we’ve had to start barricading the kitchen with baby gates. 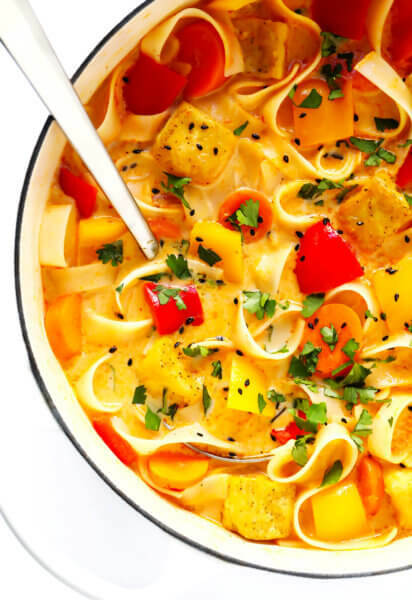 :) Recipe looks delicious as always – can’t wait to try it! Too funny! :D And we hope you guys enjoy this! Aaaand promptly leaves for the grocery store… Now craving souvlaki like crazy. I like that you put both cooking methods. Do you prefer one over the other? This was so easy to make! I fed my 15 month old, 4 year old and husband with it. Delicious! Thank you for always providing inspiring, easy and delicious recipes!! Love this! So simple, but these ingredients lend so much flavor! Thanks for the recipe! It was soooooooo delicious! My husband and I enjoyed it so much! And I used the left over for chicken sandwich on the next day! Thanks for the recipe! Kinda sorta in love with this. The perfect summertime lunch or light dinner! Totally flavorful and filling, but nothing too heavy. Gotta try this soon! Thanks, Karly! We hope you enjoy it! These look marvelous! I’m always up for anything with tzatziki. It’s my absolute favorite sauce. Pinning these to make later. Thanks for the recipe! Thank you, we hope you can give it a try soon! Now that it is summertime once again I finally have more time to make recipes from this wonderful site. This is the second time that we have whipped up this fantastic Souvlaki recipe and it was even more flavorful than before! Just replaced the lemon with a dash of lime, which also turned out amazingly well! A keeper !! Chicken was flavorful and tender ; the sauce was perfect. I used boneless chicken thighs I had on hand and got a nice char on them . Family loved this ? Excellent souvlaki! I will try one of these days with pork. Very reminiscent of souvlaki we ate in the Plaka in Athens. I was perfect for a Saturday night supper after a day in the pool. Thank you, Kevin, we’re so happy you liked it! I made this on Sunday. I let chicken marinate for four hours, put on skewers and baked on broil according to directions. Made the sauce too. So so so good! I just had the leftovers….cold….and they may have been even better! Both my husband and I liked this better than take out and we love our take out place. Thanks! I made this recipe on a night when my husband was too tired to cook and I didn’t have a ton of ingredients handy. This was an inexpensive and absolutely DELIGHTFUL meal. It was easy to make, but felt a bit luxurious. I love the idea of making the tzatziki as a dip with some pita chips/veggie sticks; I’m bringing it to my 4th of July BBQ! We love this dish!! I made it about one month ago….. and 5 times since then!! For family and friends.. Everyone Loves it! I didn’t change anything..We squeezed fresh lemon juice over the chicken after we grilled it Making it again tonight. My brother from Georgia is here… This time I am also making homemade pita break…Thanks for a great easy, yummy recipe! Making this awesome meal again today. So delicious and so easy! Thanks for sharing this with us. We’re so glad you enjoyed it, Melissa! Where do you like to get pitas locally? I made this tonight! Yum! Just got back from Greece and it wasn’t a great reminder of an awesome trip with amazing food. Just made this for my family and everyone loved it! Will definitely make this one again, thanks!! Awesome. 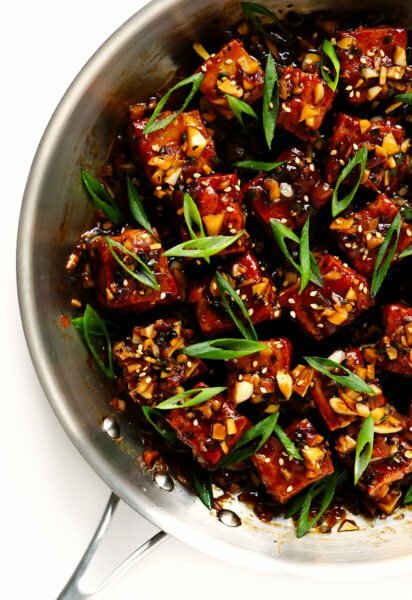 The marinade is amazing. My whole family loved it. This chicken would be great on top of a Greek salad too. This was delicious and so easy! It’s going into my rotation of weeknight recipes as my kids (4&6) both loved it. I’m currently on a restricted diet and this looked easy and tasty. I only made the chicken, not the tzatziki sauce, and it was really good. I made a salad and served the chicken over it. I really like that it didn’t call for any weird ingredients. I pretty much had everything on hand except the chicken. Will definitely make again!